Compiler will never force you to catch such exception or force you to declare it in the method using throws keyword. thanks for your efforts it is really appreciated.this is the best site i have ever seen. very clear explanation. please upload the frameworks also.then it will be very helpful to us. Thanks a lot for putting such hard work for us and I can say this is the most simplest website where the beginners really will be start focusing. It helped me and I usually go through your others subject when i get some time. Am Lecturer in Computer Science, This site is an Excellent site. Very Good Explanation and easy understandable examples. very good. update frequently. Explanation is good.But, try to give more examples. Examples are so easy. For programming examples should be more for practices. Please tell me how to handle checked and unchecked exception with example? Same mechanism is used to handle any exception. 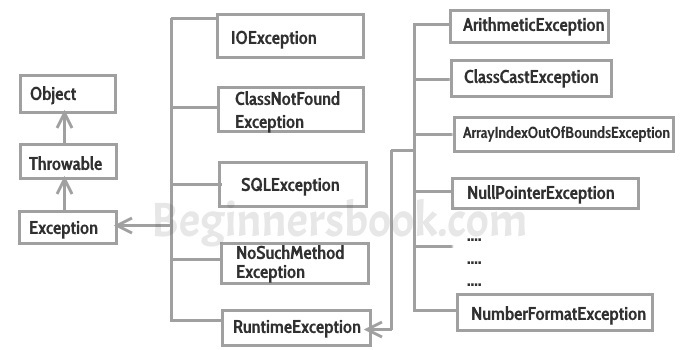 Difference between checked and unchecked exception is that if you don’t handle checked exception using try…catch block in your program then it will not compile. THis is very good site having explanation of core concepts in very simple manner. beginnersbook helped me a lot.Thank you. Beginners Book is really one of the best to the ground sites for the basic JAVA learners. Thanks a lot for it…!! What is the difference between compiler error and exception? Compiler error:when we compile the program then we will get compile time error. Exception:an unwanted unexpected event disturbs the normal flow of the program execution. What code block should we never return from and why? What is Error? Can we catch Errors? If yes, what should be done in the catch block and why? It is not strictly true… If we handle the exception correctly then it can continue processing. The way you have explained is really awesome, also you have provided the examples where ever required.